Key Stats: Two year starter at Wyoming. 44 TD, 21 Interceptions. Career 56.2% career completion. 16 TD, 6 Interceptions in 11 games as a starter in 2017. In games against Iow and Oregon, combined for only 238 yards, 0 TD, 3 Interceptions. Where He Fits on Bills: Quarterback of the future. When that will be remains to be seen. Likely will watch most of 2018 behind McCarron/Peterman. Drafted to be the eventual starter and the QB who ends the team’s drought at the position. Who He Pushes Off Bills Roster: Probably no on. Team will likely keep all three QBs. If decision is to let Allen sit and watch this year, then both McCarron and Peterman will remain so Allen wouldn’t be forced into the lineup due to injury. Expected to Start Right Away: No. Paul’s Take: I’m glad the Bills were aggressive in going up to get a quarterback. To me, that had to happen no matter who is was. Enough experienced people I trust are worried that Allen’s pocket presence and low completion percentage are problems that will never be fixed. But you can’t teach big, strong, athletic and a powerful arm. It’s up to the Bills to have a plan in place to fix Allen’s issues, and it may take some time to do that. I would not expect him to start more that a few games in 2018. This is a swing for a fences, which is fine. 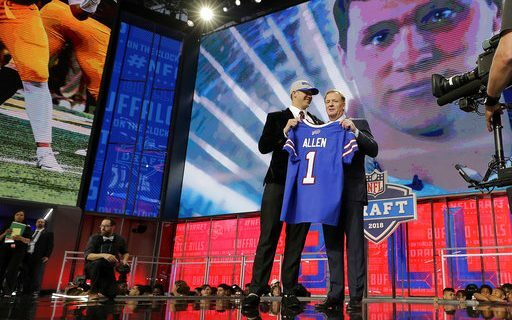 Allen has the skillset to become Cam Newton or Ben Roethlisberger. It’s up to the Bills to give him the time and coaching to do that.